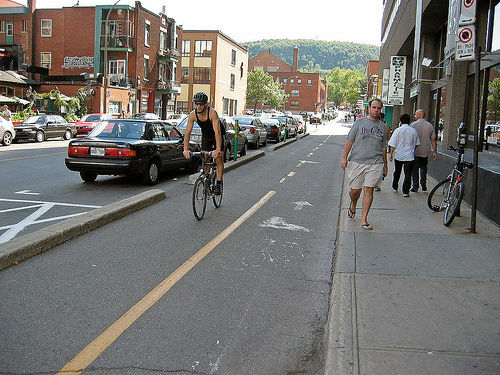 Study concludes Montreal's cycle tracks are safer than biking in the street. Photo by Paul Smith. A UTS research team developed reproducible samples of grapheme paper, a material derived from graphite with automobile applications. Grapheme was found to hold exceptional thermal, electrical and mechanical properties, and boosts being two times harder and six times lighter than carbon steel. New research from Mississippi State’s Social Science Research Center offers a silver lining for rising gas prices. The research found that the rising cost of gas drives a decline in all traffic accidents, including drunk-driving accidents. The decrease in traffic crashes was found both in the short term, within the same month of a given gas price, and intermediate term, within the same year. A new Brookings Institution report explores the concept of accessibility, outlines its place within transportation systems, and provides transportation policy recommendations that incorporate considerations to accessibility and ultimately blah blah blah funding. The report defines accessibility as the ease of reaching valued destinations, and states, with supporting examples, that accessibility creates value. Cycle tracks provide a 28 percent lower risk of injury as compared to on-street cycling, reports a new study by Harvard University researcher Anne Lusk. The study compared crash rates at six Montreal cycle tracks to those of nearby streets without cycling facilities. The report can be found in the most current issue of Injury Prevention. In accounting for these willingness to consider, the report foresees hybrid and electric vehicles to make up less than 10 percent of the US market through 2016. Suburbia houses higher non-motorized transportation rates, suggests a study on suburban multifamily housing by Nico Larco, an assistant professor at the University of Oregon. The study uncovered that residents of developments that are well-connected to commercial areas choose bicycles or walking for 44 percent of transportation to these areas. Not surprisingly, developments that were identified as lacking connectivitity produced a non-motorized transit number of roughly half the aforementioned figure. What does come as a surprise however, is that, across all studied developments, a total of 38.7 percent of all trips to nearby commercial areas are taken on foot or by bicycle. The Manitoba government is investing $1 million as a part of a $3 million, three-year project to develop an all electric transit bus. The project’s partners include New Flyer Industries, Mitsubishi Heavy Industries, Manitoba Hydro, and Winnipeg’s Red River College.